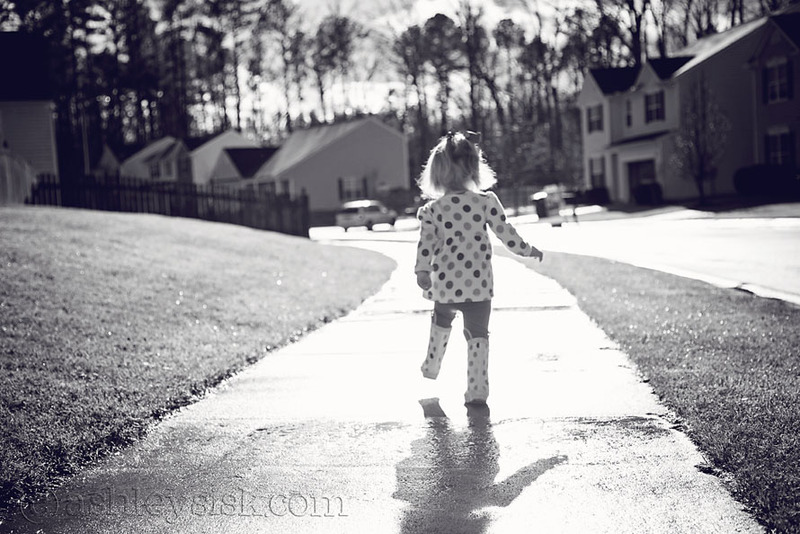 The past few days have been cold and rainy…the type of days that make you want to stay inside and sleep. I thought yesterday was going to be the same. It certainly started out that way. Then, the rain disappeared and the sun came pouring in. My husband was on a conference call upstairs, so I asked Felicity if she wanted to check the mail (an attempt to keep our noise away from his phone call). 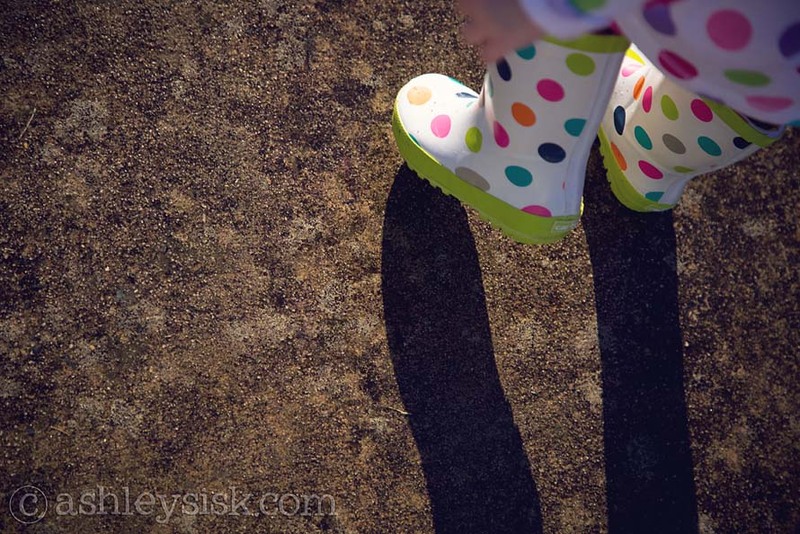 When we went outside, I was quite surprised how warm and sunny it had gotten over the course of a couple of hours. 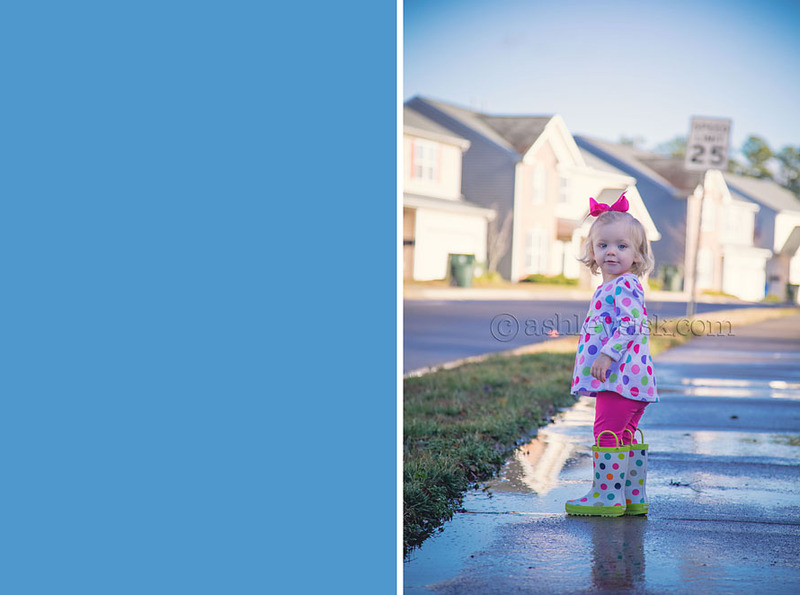 Once we were outside, it occurred to me that it was a perfect day for puddle jumping…a first for my sweet girl. 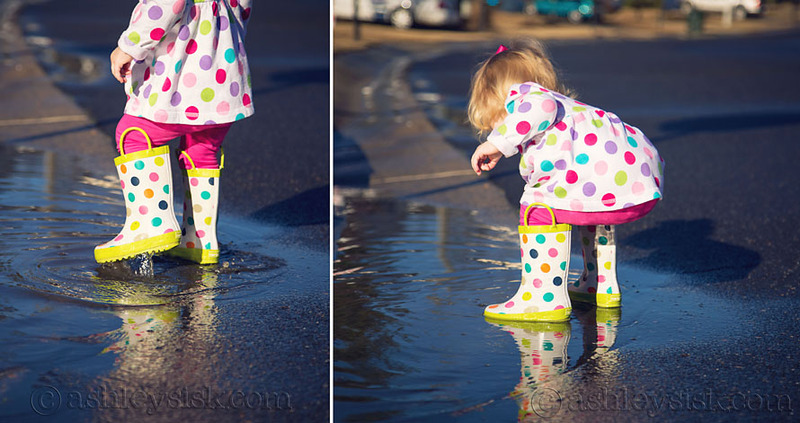 I’ve been holding onto these rain wellies for months, waiting for Felicity’s feet to grow. They’re still a bit big, but wearable. I thought she might fight me, so I waited to put them on her until we hit the garage…where I could put my boots on first. As we walked outside, she was still a bit hesitant. 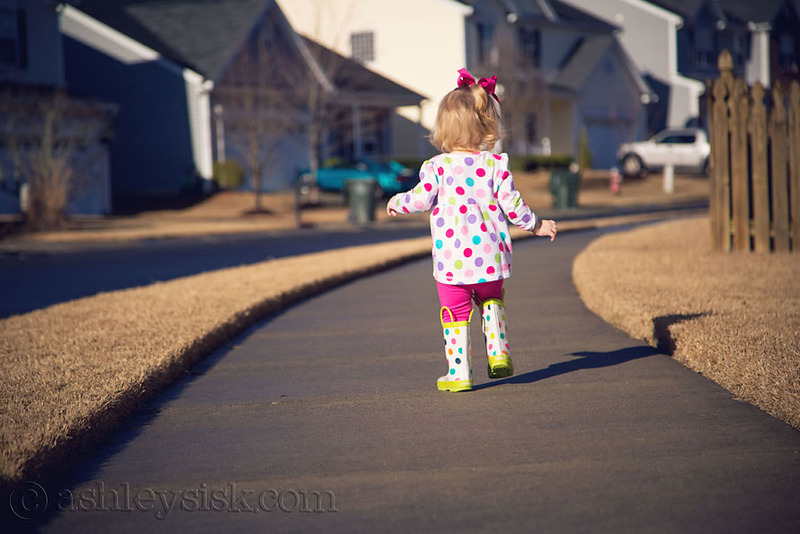 I held her hand as we walked towards the edge of our driveway. She was glad to be outside, but had no idea what kind of fun we were getting into. After showing her how it was done, Felicity took the lead. She doesn’t know how to jump yet (her jumping is more of a squatting motion), but she certainly tried. 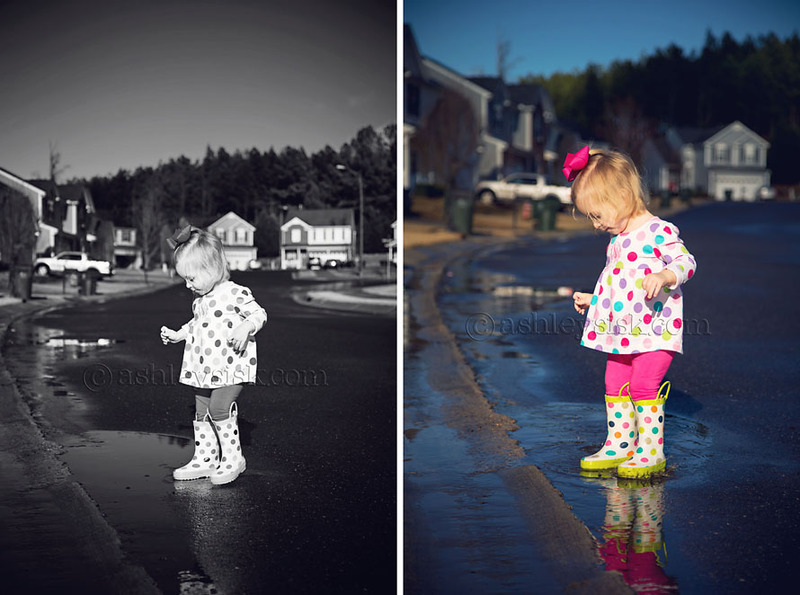 She was more effective at running away from me…often into the street to find the better puddles. This mama was a nervous wreck trying to keep her towards the edge of the street. Luckily, we were playing in the middle of the day…before the kids were home from school…before our neighbors would be home from work. As soon as I heard the first bus pull up, I knew it was time to head in. Felicity could have stayed all afternoon. 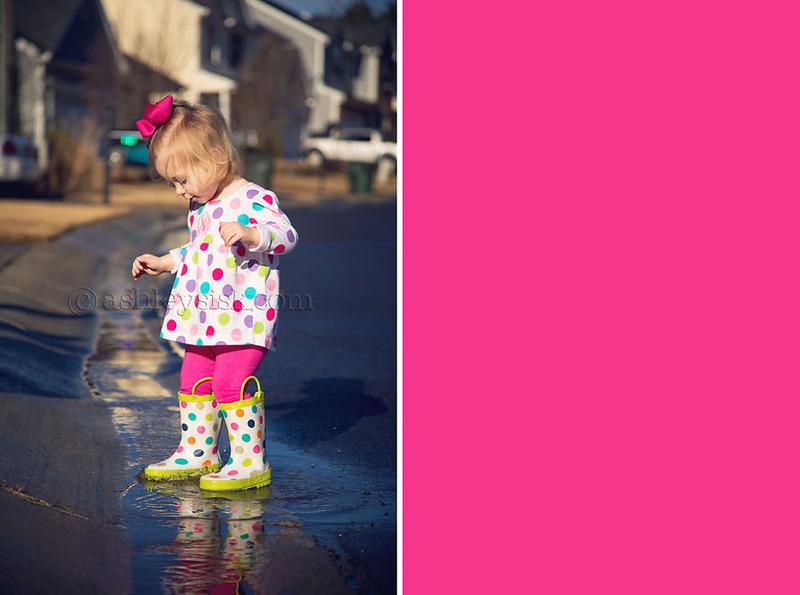 Gotta love a little girl wearing polka dots and jumping in rain puddles. What a fun day!